It also has a role to play when exercising. A low Glycemic Index snack a few hours before exercise will help maintain your energy levels for more effective training. After high intensity exercise (strength training) a high Glycemic Index snack should be consumed within thirty minutes to help replace energy and start the recovery process. The Glycemic Index is a system that measures how quickly carbohydrate foods are digested and absorbed, and ranks carbohydrate foods according to their impact on blood sugar (glucose) levels: as indicted by elevated blood glucose. Despite many years of research It has been learned the impact on blood glucose levels by certain foods is impossible to predict. Instead people were fed carbohydrate foods and the response measured, resulting in what eventually became the Glycemic Index (GI). Foods with a high GI are absorbed quickly into the blood stream and cause a rapid rise in blood glucose levels. While foods with a low GI are broken down more slowly over time and keep blood glucose levels more stable. Remember that low is slow!. Some carbohydrate foods will maintain your energy levels for hours, while some may cause your blood glucose to rise and fall. Why Is The Glycemic Index Important? Correct use of the GI will help keep your blood glucose levels resulting in a plentiful supply plenty of readily available fuel for the brain and muscles. Too low blood glucose levels will result in hypoglycaemia. You’ll feel tired, dizzy and generally unwell. If your blood glucose levels rise too quickly a rapid drop usually follows this. Low-GI foods take longer to digest and help delay hunger pangs that little bit more and thus promote weight loss. So please choose your carbs carefully as this will lower your insulin levels and burn more fat. The secret is to swap high GI foods with low GI foods. Simple Steps To A Low GI Diet. First, a healthy, well balanced diet which should be based on a good nutrition program, and should be low in fats, and moderate in carbohydrate and protein. Your diet should also be high in fiber and contain a varied amount of foods to provide the required amount of vitamins and minerals. Secondly, you need to look at the type of carbohydrates that you consume during the day. Make a list of the carbs that you eat the most, as these will have the most dramatic impact on your diet. If you find that the majority of carbs you eat are high GI it is important to change them with at least one low GI one. (Replace potato with sweet potato, use noodles instead of rice) By substituting half of your daily carbohydrate from high GI to low GI will result in an overall reduction in the GI of your diet. Reducing the GI in your diet reduces your insulin levels and increases the fat burning apparatus in your body. helping in your weight loss ambitions. Regular consumption of low GI foods increases the feelings of fullness and satisfaction and so prevents weight gain. Try taking in six small meals a day of healthy low fat low GI foods to prevent overeating at meal times and control appetite. Remember, that it is also important to choose carefully low GI foods. Some foods, such as rice and bread, might be low in fat but high in calories. When your body is burning the carbohydrates in these foods it doesn’t burn as much fat, hindering weight loss. So, if you are on a low fat diet, you won’t lose as much weight if your calories are still high. Have a look at the table below for some GI food ratings. Two slices of whole meal toast with margarine and jam. Ham and salad whole meal Roll with an apple. Four crackers with cottage cheese and chives. Two slices of low GI toast (try Burgen) with margarine and jam. Soft-serve vanilla yogurt with toasted muesli sprinkled on top. Two scoops of low-Fat ice cream with half a cup of canned peaches. With careful planning it shouldn’t be hard to convert a high Gi diet into a low one. As the menus show just using skim or low-fat milk, breakfast becomes low GI. Chicken, beef, fish, eggs, nuts, and avocados contain very little or no carbohydrates. These foods if eaten by themselves will not have much effect on your glucose levels and are very low GI. Alcoholic beverages especially wine are also low GI so can be included in your diet but remember to count them in your daily calorie intake and also, most importantly, in moderation. 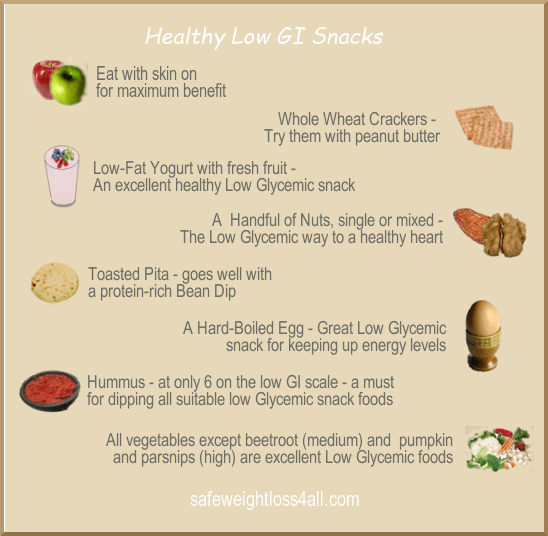 Low GI foods are ideal for losing weight due to the slow absorption from the stomach. Low GI foods also help to keep blood sugar levels more stable and this has an effect on reducing sweet cravings. The content of this post is for information only and not meant to advise. Before starting any weight loss or exercise program you should always seek professional advice. Thanks for the comment Louie, it’s most welcome. in the DIET dropdown menu which you may find interesting. on safeweightloss4all.com. Thank you for providing this valuable information. I really just wanted to say thanks – this post was precisely what I needed. Thanks for your comment, glad you found the post helpful.